Today is the 53rd birthday of Thomas Kerns, who is the owner and brewmaster of the Big Island Brewhaus in Kamuela, Hawaii. He’s originally from Oregon, and started brewing commercially for a McMenamins Pub brewery. When I met him he was the head brewer for Maui Brewery, and he was there for over ten years before striking out on his own, which opened in 2008. I first got to know Thomas a bunch of years ago when we roomed together for GABF judging. Join me wishing Thomas a very happy birthday. 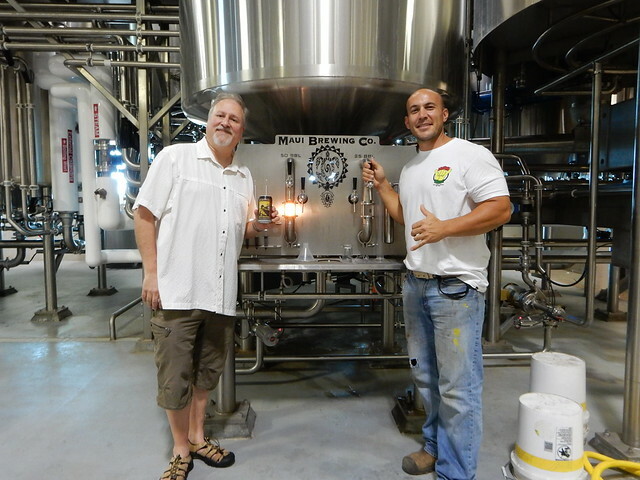 Thomas with Garett Marrero when he was still at Maui Brewing. Today is the 39th birthday of Garrett Marrero, co-founder and brewmaster of Maui Brewing. His brewery started as a brewpub on the island in 2005, and quickly expanded to include a small production brewery, but more recently Maui built a much, much bigger brewery in Kihei, which is centrally located, and not too far from the airport. I’ve known Garrett for a number of years, but finally had the chance to visit his breweries on Maui during a family vacation there during Thanksgiving week last year. 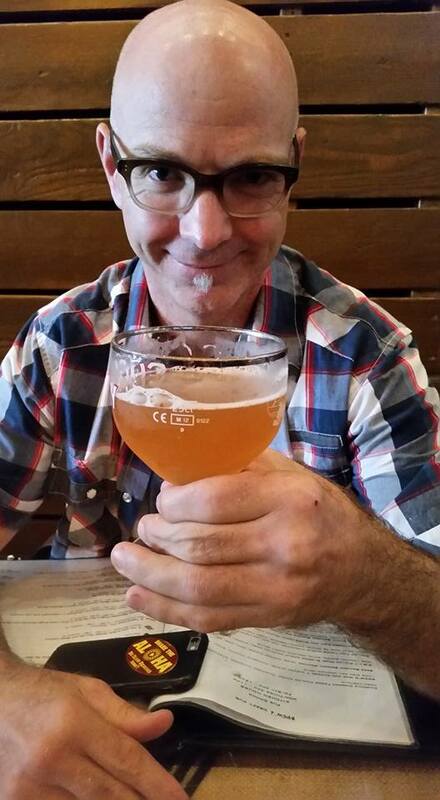 Garrett’s a great person and terrific brewer, giving you more than enough reasons to visit him on the island of Maui. Join me in wishing Garrett a very happy birthday. Garrett showing off his new brewhouse when I visited him two years ago during Thanksgiving week. At the beginning of my tour of the new production facility for Maui Brewing, naturally it started with a can of Maui beer. A 2009 promotional shot with former Maui brewer Thomas Kerns and Garrett after winning medals at GABF. Maui Brewing has announced that their new Director of Brewery Operations will be Jesse Houck. Houck was most recently at Golden Road Brewing in Los Angeles, and prior to that was in the Bay Area with both Drake’s Brewing and 21st Amendment. “I am beyond stoked to be working with such a strong leader as Garrett and the talented team he has assembled here on Maui,” stated Jesse Houck. “I’ve known Jesse for most of my career in craft beer and have always been impressed with his brewing talent, and proud to call him a friend. I’m stoked to have him at the helm of our brewing operations and we’re looking forward to some awesome projects coming down the pipe,” added Founder and CEO Garrett Marrero. I recently visited the new facility that Maui Brewing built and turned loose in that brewhouse, Jesse’s going to do great things. It also really makes me want to go back to Maui again, not that I needed much incentive. It’s an amazing space that Garrett and Melanie Marrero built closer to the center of the island, and not too far from the airport. With two new planned restaurants in their future, adding Jesse was a prudent move. Congratulations to both. 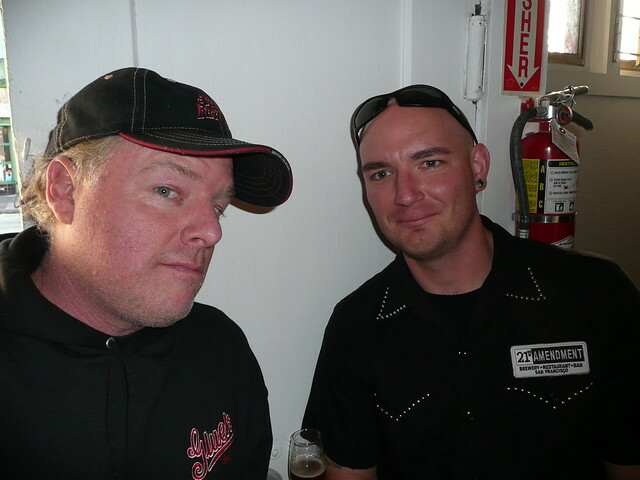 Jesse (right) with Shaun O’Sullivan at the Toronado Barleywine Festival in 2008. Today in 1959, Hawaii became the 50th state. Sale Hours: On Premises: Bars and restaurants stop serving alcohol at 2 a.m., but some hold a special ‘cabaret license’ that allows them to continue serving alcohol until 4 a.m.
Off Premises: 11:50 a.m. to 12 a.m.
Data complied, in part, from the Beer Institute’s Brewer’s Almanac 2010, Beer Serves America, the Brewers Association, Wikipedia and my World Factbook. If you see I’m missing a brewery link, please be so kind as to drop me a note or simply comment on this post. Thanks. For the remaining states, see Brewing Links: United States. The Oregonian is reporting that the Craft Brewers Alliance (essentially Widmer, with RedHook and distribution of Goose Island and Kona) will purchase Kona Brewing for $13.9 million. Under the terms of the agreement, Kona will become a “wholly owned subsidiary” and Mattson Davis will remain at the helm, with brewing for the mainland continuing to be done at Widmer and RedHook breweries. Today is another anniversary, this time for beer in Hawaii. The first recorded brewing of beer in Hawaii took place on February 2, 1812. 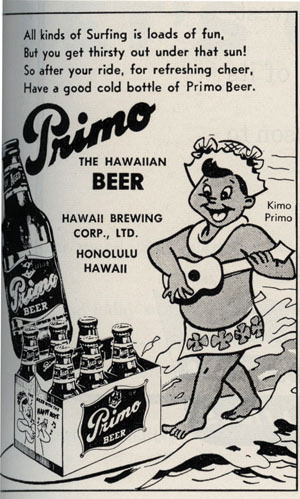 So Tuesday’s ad is for Primo Beer, one from 1958, the year before Hawaii became a state. You can see more about Hawaii Brewing at the online Hawaiian Beverage Museum. 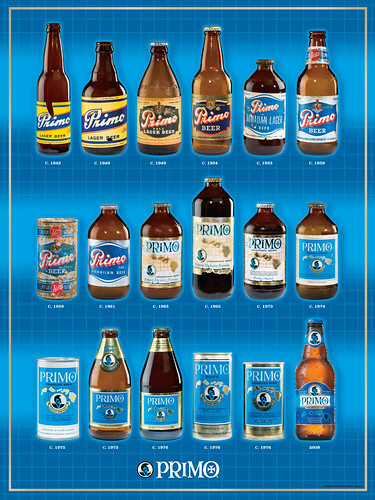 Below, while not exactly an ad, is a cool poster showing the evolution of Primo Beer labels and packages from 1943 to the present. Click through the image to see the poster larger. Yesterday’s Honolulu Advertiser had a nice profile of Maui Brewing (thanks Doug). 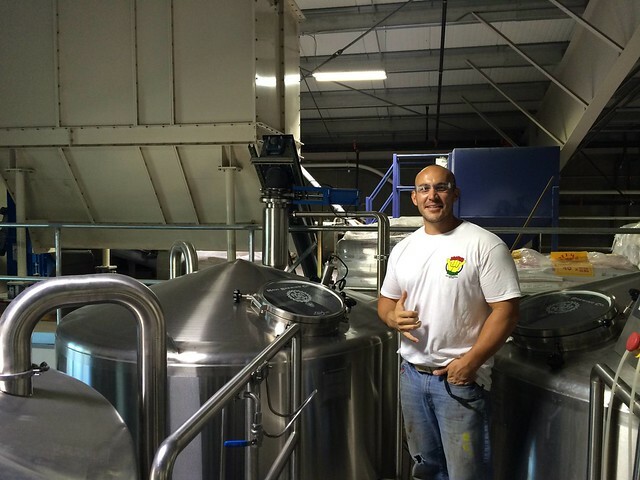 It’s a nice overview of how Sacramento resident Garrett Marrero moved to Kahana, on Maui, after buying the old Fish and Game Brewing Co. & Rotisserie. They’ve also started hand-canning their beers, which are now featured on Hawaiian Airlines, which is a great package for an island like Hawaii. 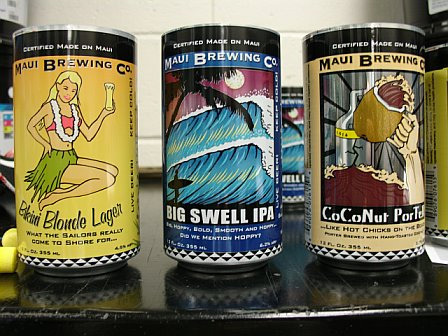 Three of Maui’s beers in cans. The Porter won a gold medal at last year’s GABF. There’s a nice photo series of their first canning on their website. Brewmaster Thomas Kerns owner Garrett Marrero. Tom was my judging roomie at last year’s Great American Beer Festival.